Financial markets around the world are grappling with the fact that the Chinese economy is slowing, with the Bank of China acting to devalue the yuan earlier this week. A number of economic statistics continue to reflect decelerating activity levels, particularly relative to the paces observed earlier in the year or last year. These include industrial production, fixed asset investments and retail sales. Moreover, the Caixin China General Manufacturing PMI declined from 49.4 in June to 47.8 in July, its lowest level since July 2013. The headline PMI measure has now contracted in seven of the past eight months. While real GDP expanded by 7.0 percent in the second quarter, other measures seem to cast some doubt on that figure, with weaker growth anticipated moving forward. Beyond these economic statistics, the Shanghai Stock Exchange Composite Index has fallen nearly 25 percent since June 12 despite efforts by the government to prop up stock values. The events in China add an extra wrinkle to a global economy has that already been challenged for much of this year. Manufacturers in the United States, for instance, have struggled to grow exports so far this year, with the strong U.S. dollar and weak economic growth abroad dampening international demand. According to the latest seasonally adjusted figures from TradeStats Express, U.S.-manufactured goods exports declined 4.16 percent year-to-date through the second quarter relative to the same time period in 2014. Manufactured goods exports increased strongly to the United Kingdom, our fifth-largest trading partner, up 12.50 percent year-to-date. However, this was counteracted by weaknesses to our top four trading markets: Canada (down 6.64 percent), Mexico (essentially flat, up just 0.03 percent), China (down 0.95 percent) and Japan (down 0.69 percent). Moreover, net exports have served as a drag on economic growth in the United States, subtracting 1.92 percentage points from real GDP in the first quarter alone. In contrast, there have been some encouraging signs coming out of Europe despite uncertainties in Greece. The Markit Eurozone Manufacturing PMI declined ever so slightly from 52.5 in June to 52.4 in July. The June reading was the fastest pace since April 2014, and that rate of expansion was mostly sustained in this latest survey. Indeed, Eurozone manufacturing activity has now expanded for 23 consecutive months. Real GDP rose 0.4 percent in the first quarter, or 1.0 percent year-over-year, and we expect that figure to tick slightly higher with new second quarter data out on August 14. The expectation is that the year-over-year pace will improve to 1.4 percent in the second quarter, which is also the forecast for 2015 as a whole. Deflation has been a concern in recent months, spurring quantitative easing moves by the European Central Bank, but the annual inflation rate was positive, albeit barely, for the third straight month. Overall, the global economy continued to expand slowly. The J.P. Morgan Global Manufacturing PMI continued to reflect relatively soft levels of expansion, with slowdowns in key markets weighing heavily on the headline number. In addition to “green shoots” in Europe, there was also some progress in North America, including the United States. The country-by-country analysis reflected similar trends. Manufacturing activity in four of the top 10 markets for U.S.-manufactured goods contracted in July, the same as in June but down from five in May and six in April. The four countries with contracting activity levels were Brazil, China, Hong Kong and South Korea. Each of these nations has seen falling levels of demand and production for several months. In contrast, the other top markets continued to expand, but at differing rates of growth, with the Netherlands remaining as the bright spot in the top 10, with decent growth overall despite some easing in July. Efforts to reauthorize the Export-Import (Ex-Im) Bank will continue in September as Congress failed to enact new legislation before the August recess. The Trans-Pacific Partnership (TPP) and Transatlantic Trade and Investment Partnership (TTIP) talks continue to be bolstered by new momentum from the enactment of Trade Promotion Authority (TPA). Congress continues to consider customs modernization and other legislation. The global economy continued to expand slowly, with activity remaining challenged in many key markets. The J.P. Morgan Global Manufacturing PMI (unchanged at 51.0) continued to reflect relatively soft levels of expansion, with slowdowns in Asia and South America weighing heavily on some markets. At the same time, there were some signs of progress for U.S. manufacturing (up from 53.6 to 53.8), and Eurozone activity (down from 52.5 to 52.4) held up fairly well given uncertainties in Greece. Looking at the underlying data in the global report, output (up from 51.4 to 51.6) edged slightly higher, but new orders (down from 51.3 to 51.2) and employment (down from 50.9 to 50.7) were both marginally lower. Growth in exports (down from 50.8 to 49.9) essentially stagnated, dragging down the headline sales number. The country-by-country analysis reflected similar trends. Manufacturing activity in four of the top 10 markets for U.S.-manufactured goods contracted in July, the same as in June but down from five in May and six in April. The four countries with contracting activity levels were Brazil (up from 46.5 to 47.2), China (down from 49.4 to 47.8), Hong Kong (down from 49.2 to 48.2) and South Korea (down from 47.6 to 46.1). Each of these nations has seen falling levels of demand and production for several months, with decelerating growth in China helping to pull the other Asian economies lower. In contrast, the other top markets continued to expand, but at differing rates of growth. The Netherlands (down from 56.2 to 56.0) continued to be the bright spot in the top 10, with decent growth overall despite some easing in July. Growth also eased slightly in Canada (down from 51.3 to 50.8) and Germany (down from 51.9 to 51.8). Yet, the news was somewhat better in Japan (up from 50.1 to 51.2), Mexico (up from 52.0 to 52.9) and the United Kingdom (up from 51.4 to 51.9), with slight accelerations in production growth for the month for each nation. Chinese manufacturing activity fell to a two-year low in July. The Caixin China General Manufacturing PMI declined from 49.4 in June to 47.8 in July, its lowest level since July 2013. The headline PMI measure has now contracted in seven of the past eight months. In addition, manufacturers in China reported lower activity levels in most of the key indices, including for new orders (down from 50.3 to 47.2), output (down from 49.7 to 47.1) and exports (down from 50.3 to 46.9). Employment (up from 46.6 to 47.2) was the only area where there was slight progress, with the rate of the decrease in hiring slowing slightly in July. However, hiring has now contracted for 21 straight months. Meanwhile, the official manufacturing PMI numbers from the National Bureau of Statistics of China also indicated some slowing in the sector, but with its index down from 50.2 to 50.0. These figures suggest modest growth in production, with medium-sized and large manufacturers faring better than their smaller counterparts. Real GDP expanded by 7.0 percent year-over-year in the second quarter, bucking expectations that predicted further deceleration in growth. Indeed, other measures have indicated a slowdown. For instance, year-over-year industrial production growth has eased from 6.8 percent in June to 6.0 percent in July. One year ago, the year-over-year pace was 9.0 percent. Likewise, fixed asset investments increased 11.2 percent year-over-year in July, down from 11.4 percent in June and 17.0 percent in July 2014. At the same time, retail sales numbers provided mixed comfort. Retail spending grew 10.5 percent year-over-year in July, down from 10.6 percent in June but up from 10.0 percent in April. Still, even with slightly better sales data since the spring, the pace has decelerated from 12.2 percent year-over-year 12 months ago. Beyond these economic statistics, the Shanghai Stock Exchange Composite Index has fallen nearly 25 percent since June 12 despite efforts by the government to prop up stock values. With sluggish economic growth in mind, the Bank of China devalued its currency on August 11. The government has said that it will let the market dictate where it sets the yuan relative to other currencies, which is a nod toward critics who have sought an exchange rate that more freely matches the market; yet, for now, this was likely a move to boost its struggling economy. As a result, one dollar bought 6.3874 Chinese yuan on August 12, up 2.9 percent from the 6.2097 close on August 10. European economic growth mostly held up despite uncertainties in Greece. The Markit Eurozone Manufacturing PMI declined ever so slightly from 52.5 in June to 52.4 in July. The June reading was the fastest pace since April 2014, and that rate of expansion was mostly sustained in this latest survey. Indeed, manufacturing in the Eurozone has seen progress since being essentially stagnant in November (50.1). Output growth in July continued to expand despite being unchanged for the month at 53.6, whereas new orders (down from 52.7 to 52.2) were off slightly on weaker exports (down from 52.7 to 51.5). On the other hand, hiring (up from 51.7 to 51.8) picked up marginally. Overall, Eurozone manufacturing activity has now expanded for 23 consecutive months, which is encouraging. Real GDP rose 0.4 percent in the first quarter, or 1.0 percent year-over-year, and we expect that figure to tick slightly higher with new second quarter data out on August 14. The expectation is that the year-over-year pace will improve to 1.4 percent in the second quarter, which is also the forecast for 2015 as a whole. Nonetheless, there have also been signs of recent softness, with industrial production and retail sales down 0.4 percent and 0.6 percent in June, respectively. Economic sentiment has also weakened. Still, real household income was higher in the first quarter of 2015, and the unemployment rate was unchanged at 11.1 percent, continuing to be its lowest level in three years. Deflation has been a concern in recent months, spurring quantitative easing moves by the European Central Bank, but the annual inflation rate remained steady at 0.2 percent in July, the third straight month with positive price growth. Looking at specific European markets, we continued to experience relatively strong growth in Ireland (up from 54.6 to 56.7), Italy (up from 54.1 to 55.3) and the Netherlands (down from 56.2 to 56.0), with each experiencing production gains in July. Of particular note, Italian new orders were at their fastest pace since February 2011, and output and exports in the Netherlands were at their strongest rate since December 2013. Meanwhile, several other markets expanded at a modest pace, even as some softened a bit for the month. These included Austria (up from 51.2 to 52.4), Germany (down from 51.9 to 51.8), Spain (down from 54.5 to 53.6) and the United Kingdom (up from 51.4 to 51.9). While activity decelerated slightly in Spain, it was promising that hiring rose at its quickest rate since January 2007. Yet, it was not all good news. France (down from 50.7 to 49.6) slipped back into negative territory, with manufacturing activity contracting during 14 of the past 15 months. Also, given the continuing political drama in Greece (down from 46.9 to 30.2), it should be no surprise that its PMI value fell to an all-time low in that survey, which began in 1999. Canada expanded at a slower pace in July after stabilizing in June. The RBC Canadian Manufacturing PMI declined from 51.3 in June to 50.8 in July. While the pace of growth eased slightly, it was the second consecutive monthly expansion following four months of contraction. The slower pace stemmed from weaker growth in output (down from 52.9 to 51.6), exports (down from 52.0 to 50.8) and employment (down from 50.4 to 49.5). Hiring has now contracted in six of the past seven months. New orders were unchanged at 50.9, expanding at a very slight pace on net. As noted in prior reports, growth varied widely from region to region, with Ontario demand and production expanding at a decent pace, albeit with some deceleration in July, whereas Alberta and British Columbia continue to experience softness from lower crude oil prices. While sentiment numbers reflect improvement, other economic indicators remain weak. Output in the manufacturing sector fell 1.7 percent in May led by strong declines for durable goods, including machinery. Meanwhile, the unemployment rate held steady at 6.8 percent for the sixth straight month in July. However, manufacturers lost 4,600 workers on net for the month. More positively, retail sales rose 1.0 percent in May, providing some encouragement that consumers have begun to increase their purchases. In addition, construction activity picked up, with both residential and nonresidential building permits rebounding in June from weaker data in May. Residential permitting was up 8.1 percent year-over-year, boosted primarily by permits for multifamily units. Mexico’s manufacturing sector expanded modestly in July. The Markit Mexico Manufacturing PMI increased from 52.0 to 52.9, picking up after registering its lowest level since July 2014 the month before. Activity was higher across the board for the month, including new orders (up from 53.1 to 54.8), output (up from 52.3 to 53.3), exports (up from 52.1 to 55.7) and hiring (up from 51.0 to 52.4). The exports figure represented the fastest pace since May 2011. Manufacturing production rose 4.2 percent year-over-year in June, the highest annual rate of growth since February. Yet, even that figure remains weaker than we would like to see. For instance, output in the sector grew 5.8 percent year-over-year in December, and other sectors in the Mexican economy expanded in June at a much slower pace (e.g., electricity and construction both grew by 2.1 percent year-over-year). The emerging markets slipped further into contraction territory in July. The Markit Emerging Markets Manufacturing Index decreased from 49.5 to 49.1, its lowest level in two years. New orders (down from 49.7 to 49.1), output (down from 49.5 to 48.7) and exports (down from 49.9 to 48.6) declined at a faster rate in July, with the decrease in employment (up from 48.5 to 48.7) easing slightly for the month. However, manufacturers remained cautiously upbeat about the coming months, albeit with sentiment down for the fifth consecutive month. The forward-looking output index (down from 62.0 to 59.4) remained relatively strong despite falling in June and declining to its lowest level since being introduced in early 2012. A number of countries had contracting levels of manufacturing activity in May, many of which have been declining for several straight months. These included Brazil (up from 46.5 to 47.2), China (down from 49.4 to 47.8), Hong Kong (down from 49.2 to 48.2), Indonesia (down from 47.8 to 47.3), Russia (down from 48.7 to 48.3), South Africa (down from 49.2 to 48.9), South Korea (down from 47.6 to 46.1) and Taiwan (up from 46.3 to 47.1). Yet, there was some encouraging news out of Turkey (up from 49.0 to 50.1), which stabilized ever so slightly in July. (To be fair, Turkey has been essentially neutral or in contraction territory every month so far this year.) In contrast to those nations, India (up from 51.3 to 52.7) and Vietnam (up from 52.2 to 52.6) benefited from relatively decent demand and production growth. The bright spots in the emerging markets continued to be in Eastern Europe. The Czech Republic (up from 56.9 to 57.5) and Poland (up from 54.3 to 54.5) both had healthy sales growth for the month. The U.S. dollar remains strong, and the price of crude oil fell to a six-year low. The dollar has continued to accelerate, mostly recovering from the pullback since the spring. The euro exchanged for $1.1173 on August 12. In general, the dollar has appreciated significantly across the past year, particularly after it peaked on May 6, 2014, at $1.3924 for each euro. Along those lines, the trade-weighted U.S. dollar index against major currencies from the Federal Reserve Board has risen from 75.6968 on July 1, 2014, to 92.6677 on August 7, 2015, a 22.4 percent increase. (The data are revised each Monday and do not reflect the strengthening seen during the past week.) This index reflects currency units per U.S. dollar, suggesting that the dollar can now purchase more than it could before and vice versa. Meanwhile, the price of petroleum fell again during the past week, the result of a stronger dollar and weaknesses in China. The price of West Texas Intermediate crude reached a recent peak of $61.36 per barrel on June 10. Crude oil prices have fallen dramatically since then, closing at $43.37 on August 12. That figure is the lowest since March 2009, when the United States was still in the Great Recession. In the larger context, the current price is off roughly 60 percent from last year’s high of $107.95 per barrel on June 20, 2014. The U.S. trade deficit widened somewhat in June. The trade deficit rose from $40.94 billion in May to $43.84 billion in June, its highest level in three months. This was largely the result of an increase in goods imports, up from $188.40 billion to $191.06 billion. Goods exports were marginally lower, down from $127.79 billion to $127.56 billion. However, despite shifts from month to month, the U.S. trade deficit has not changed much over the past year and a half. It averaged $42.62 billion in the first half of 2015, which is only slightly higher than the $42.36 billion average in all of 2014. Looking specifically at goods exports, U.S. firms exported more consumer goods (up $795 million) and automotive vehicles (up $62 million) in June. However, declining exports for nonautomotive capital goods (down $769 million), industrial supplies and materials (down $617 million) and foods, feeds and beverages (down $460 million) offset these gains. In contrast, goods imports were mostly higher for the month. Imports rose for consumer goods (up $1.73 billion), industrial supplies and materials (up $1.18 billion), foods, feeds and beverages (up $663 million) and automotive vehicles and parts (up $332 million). The exception was a decrease in imports for nonautomotive capital goods, led by computers and industrial machines, down $1.32 billion. 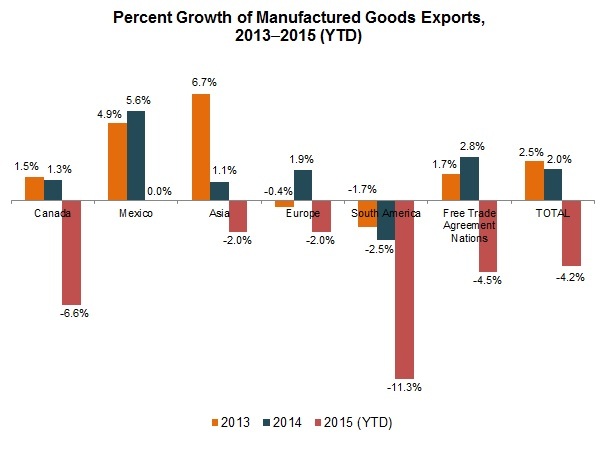 Manufactured goods exports have declined so far this year. In general, manufacturers have had a rough first half of 2015, with the strong U.S. dollar and sluggish international growth dampening global demand. According to the latest seasonally adjusted figures from TradeStats Express, U.S.-manufactured goods exports declined 4.16 percent year-to-date through the second quarter relative to the same time period in 2014. Manufactured goods exports increased strongly to the United Kingdom, our fifth-largest trading partner, up 12.50 percent year-to-date. However, this was counteracted by weaknesses to our top four trading markets: Canada (down 6.64 percent), Mexico (essentially flat, up just 0.03 percent), China (down 0.95 percent) and Japan (down 0.69 percent). This report helps to illustrate why the manufacturing sector has continued to struggle even as other economic data have shown some signs of a rebound. It is important for policymakers to do whatever they can to improve the global competitiveness of the sector. Beyond improving the overall business climate in the United States, our leaders should also focus on new trade agreements that will help to open new markets, reauthorize the Ex-Im Bank and pass the Miscellaneous Tariff Bill (MTB). TPP talks require more time to reach a deal. On July 31, TPP ministers announced “significant progress” during the latest round of negotiations in Maui, Hawaii, but indicated that additional discussions are needed to resolve “a limited number of remaining issues.” No time frame was set for resolving or completing the TPP talks, but the ministers emphasized they will be in close coordination through bilateral discussions and other efforts to resolve these issues. The NAM worked with our negotiators and members throughout the negotiating round to urge strong outcomes that embrace manufacturing priorities. NAM President and CEO Jay Timmons released the NAM’s TPP priorities at the start of the week, and the NAM amplified our voice with Shopfloor blog posts on key issues. The NAM also spearheaded efforts with others in the business community to urge an ambitious outcome, not a lowest common denominator approach, as the week progressed. Following the ministers’ announcement, the NAM released this statement, expressing disappointment that a high-standard deal could not be completed and our appreciation for the hard work of our negotiators. TTIP talks resume this fall. U.S. and European Union (EU) negotiators met in Brussels, Belgium, July 13–17 for the 10th round of TTIP talks. During these meetings, U.S. and EU negotiators continued discussions on a range of issues important to manufacturers, including regulatory coherence, intellectual property and customs measures. It is expected that discussions on two other issues critical for manufacturers—tariffs and investment protections—will intensify during the 11th round of talks, expected to take place October 19–23 in Miami, Fla. It is likely that investment negotiations between the United States and European Union will resume in the October round given EU Parliament support for a new EU investment approach. The eighth round of EGA negotiations took place July 27–31 in Geneva, Switzerland, where discussions continued on the approximately 660 products nominated for duty-free treatment by the United States and other countries. Specifically, negotiators discussed where convergence may exist in terms of export priorities, countries’ import sensitivities and customs-related challenges. The NAM helped set up meetings for businesses attending the round and is holding a debriefing with United States Trade Representative (USTR) negotiators for our membership and the Coalition for Green Trade, which the NAM co-chairs. The ninth round will be held September 16–22 in Geneva. Despite Senate support, Congress failed to reauthorize the Ex-Im Bank before the August recess. Despite strong votes in the Senate on July 27 (64-29) and previously on July 26 (67-26) in support of adding a five-year reauthorization of the Ex-Im Bank to the long-term highway bill that later passed the Senate, the House failed to take up this legislation. The amendment (S.A. 2327), which is identical to the Export-Import Bank Reform and Reauthorization Act of 2015 (S. 819) introduced by Sens. Mark Kirk (R-IL) and Heidi Heitkamp (D-ND) earlier this year, would reinstate the Ex-Im Bank’s charter and extend it through September 30, 2019. NAM President and CEO Jay Timmons issued a statement before the initial procedural vote, and the NAM sent a Key Vote letter to senators on the amendment. The NAM will continue to urge policymakers to reauthorize the Ex-Im Bank when Congress returns in September. The Trade Facilitation and Trade Enforcement Act of 2015 (H.R. 644) passed the Senate in May and the House in June with differing provisions in a number of critical areas. Although formal House–Senate negotiations were not initiated before the August recess, informal work continues. The NAM supports the elements of Title I that will allocate resources, streamline trade and measure progress within U.S. Customs and Border Protection (CBP). In Title IX, manufacturers strongly support the new de minimis threshold, the exemption from duty for container residue, changes to Chapter 98 of the Harmonized Tariff Schedule that will reduce the recordkeeping burden on goods returned to the United States without improvement abroad and provisions to simplify duty drawback that would incorporate an eight-digit classification system. In addition, the NAM sent a letter in support of including in the final bill an amendment offered by Sen. Jeanne Shaheen (D-NH) to make trade agreements work better for small businesses and to reauthorize the State Trade and Export (STEP) program (S.A. 1416). The provisions of that amendment are important to address a host of competitiveness barriers that small businesses face when turning to overseas markets for growth. The NAM continues to support strongly the Enforcing Orders and Reducing Customs Evasion (ENFORCE) Act (S. 1015) and issued a joint business letter urging the inclusion of these provisions in the final conference report. The NAM is also seeking to have included in the conference report provisions from the Senate bill that provide additional tools and guidance to the Obama Administration for improving intellectual property protection and enforcement overseas. The NAM’s efforts on the MTB are discussed below. The NAM continues to lead coalition efforts to ensure inclusion of a transparent, objective, predictable and regularized process for Congress to consider and enact MTBs in the final conference report for the Trade Facilitation and Trade Enforcement Act of 2015 (H.R. 644). The Senate included language that would introduce a new MTB process in its version, which passed the chamber in May. The NAM has organized regular coalition meetings and calls on MTBs, led advocacy meetings on Capitol Hill, released blog posts and spearheaded a July letter signed by 52 associations that was sent to the chairmen and ranking members of the Senate Finance and House Ways and Means committees, urging the committees to include a new MTB process in H.R. 644. The NAM also led coalition efforts to get 58 House Republicans to sign a letter spearheaded by Rep. Mark Walker (R-NC) urging the inclusion of a new MTB process in the final version of H.R. 644 as well as a similar letter organized by Sen. Richard Burr (R-NC) with 48 Senate Republican and Democratic signees. Country-of-Origin Labeling (COOL) reform awaits Senate action. The NAM is also continuing to co-lead the COOL Reform Coalition and end the threat of retaliation against U.S.-manufactured exports following a final judgment on May 18 by the World Trade Organization (WTO) against the United States in the COOL dispute. In June, Canada requested retaliatory measures of $2.5 billion against the United States, and Mexico announced that it is seeking $713 million in retaliatory measures. The USTR has opposed the level of retaliation, and the WTO panel adjudicating the level of retaliation will make a decision by early fall on the amount of retaliation authorized. Subsequent to the WTO decision, the House passed legislation on June 10 to repeal the noncompliant provisions, which Sen. Pat Roberts (R-KS) raised in the Senate. Given the NAM’s primary objective to avoid retaliation by Canada and Mexico and to prevent a loss of export sales by our nation’s manufacturers, the NAM continues to support passage of Sen. Roberts’ provisions and sent this letter to the Senate on August 4, urging action on the senator’s proposal, calling full repeal “the only viable option” to prevent retaliation. Trade secrets legislation introduced in Congress. The Defend Trade Secrets Act of 2015 was introduced in both the House and Senate in July, with the strong support of the NAM and our member companies. This legislation would create a federal civil private right of action for economic espionage, trade secret theft or misappropriation of a trade secret. The legislation also would require the U.S. government to report on the scope and breadth of trade secret theft overseas, trade secret protections afforded by foreign countries and activity to promote greater trade secret protection in foreign markets, including through trade agreements. The NAM had previously testified on an earlier version of this legislation and issued our support recently in a letter to both the House and Senate as well as in a joint business letter to the Senate. We will be looking for action on this important legislation in the fall. Focus on improving U.S.–India commercial relationship continues. The United States and India are preparing for the Strategic and Commercial Dialogue in mid-September in Washington, D.C., following the elevation of the U.S.–India Strategic Dialogue in January, with the aim to strengthen U.S.–India relations on commercial and broader issues. The NAM is working with U.S. government officials and lawmakers to promote action on key priorities, such as India’s removal of industrial policy and localization barriers, protection and enforcement of intellectual property rights, elimination of tariff and nontariff barriers and improvement of government regulatory processes, such as food approval reviews. CBP launches pilot program for the electronic submission of air cargo manifests. CBP recently announced plans to conduct an Automated Commercial Environment (ACE) Export Manifest for Air Cargo Test, a National Customs Automation Program test on ACE export manifest capability. The ACE Export Manifest for Air Cargo Test is a voluntary test in which participants agree to submit export manifest data electronically at least four hours prior to loading cargo onto an aircraft in preparation for departure from the United States. CBP regulations require carriers to submit a paper manifest for export air shipments within four days after departure. The pilot program will begin no earlier than August 10 and will run for approximately two years. CBP is accepting applications for nine participant slots, and comments may be submitted anytime during the pilot period. CBP is starting a phased release of ACE component functionality designed to replace specific legacy Automated Commercial System (ACS) or paper functions, including an electronic export manifest process. President Obama announced a multilateral deal to limit Iran’s nuclear capabilities and ease sanctions. On July 14, President Obama announced a final deal between the P5+1 (France, Britain, China, Russia and the United States plus Germany) and Iran to curb Iran’s nuclear program and provide sanctions relief. Secretary of State John Kerry also spoke to the press in Vienna, Austria, about the deal. The full text of the Joint Comprehensive Plan of Action is available here. The UN Security Council endorsed the agreement on July 20. Under the Iran Nuclear Agreement Review Act of 2015, Congress has 60 days to review the deal and the option to vote on approving or disapproving it. United Kingdom launches new expedited entry program. The United Kingdom recently launched a “Registered Traveller” program to provide expedited entry for qualified citizens of the United States, Australia, Canada, Japan and New Zealand. In addition to citizenship from one of the countries listed above, travelers must be over 18 years of age and either hold a valid visa (except Tier 5, sporting and creative concessions, European Economic Area (EEA) family permits, discretionary leave and leave outside the rules) or have visited the United Kingdom four times in the past calendar year in one of the following categories: business, general, academic, in transit, entertainment or sports visitor, parents with a child in a UK school or medical visitor. For more information, click here. This two-day conference will showcase economic growth and development opportunities in Tamil Nadu and provide participants with insight into why the state is a leading destination for foreign investment in India. Sessions and seminars will display Tamil Nadu’s pro-growth government policies, natural resources and workforce training. Breakout sessions will focus on international investment opportunities for various industries. For more information, click here. The 2015 Trade Winds program will provide U.S. businesses an opportunity to explore markets throughout the African continent through a business forum and trade mission stops in eight sub-Saharan nations. The business forum, hosted in South Africa, will feature government senior diplomats from 19 different African nations and focus on best practices and networking opportunities for U.S. businesses operating in Africa. In conjunction with the forum, participants can conduct business-to-business meetings with prescreened firms in Angola, Ethiopia, Ghana, Kenya, Mozambique, Nigeria, South Africa and Tanzania. For more information, click here. This fall, the U.S. Commercial Service will partner with local export and trade agencies to host a series of daylong programs focused on hands-on, practical application and case studies on compliance with U.S. export control regulations. These one-day programs will include a diverse selection of expert speakers and provide participants with the knowledge needed to utilize export control reform. SupplySide West is an annual meeting of finished consumer goods businesses to showcase the latest trends and innovations in the industry. The meeting format includes in-depth education tracks, summits, interactive panels and workshops designed to bring participants up to speed on current trends in the animal nutrition, beverage, cosmetics, dietary supplements, sports nutrition, food and pharmaceutical industries. For more information, click here. The U.S. Commercial Service and the District Export Council of Southern California will host a two-day conference on consumer markets throughout Asia and the Pacific region. The program will provide in-depth market intelligence on specific countries, regions and industries; guidance on marketing, distribution and intellectual property protections; and opportunities to network with senior business leaders. For more information, click here. This two-day conference will cover the latest and most critical developments in regulatory policy and best practices in the global economy. Panelists will include policy experts from the European Commission and UK government, law enforcement officials and industry representatives. The event will also provide networking opportunities with issue experts and industry peers. For more information, click here. The U.S. Commercial Service and GTSM will host a unique opportunity for U.S. green technology manufacturers to meet with foreign governments and other customers through prearranged business-to-business meetings. Over the course of the three-day conference, participants will hear presentations on top issues facing the industry, attend workshops on new market developments and innovations and meet with preselected customers and suppliers. The event will draw entities from all portions of the supply chain, including energy departments, international utilities, research centers and equipment suppliers. For more information, click here.